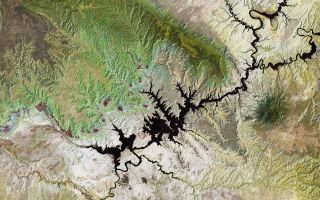 This Landsat image from July 19, 2011 shows Lake Powell, a reservoir on the Colorado River in the southwestern United States. In this space wallpaper, a Landsat image from July 19, 2011 shows Lake Powell, a reservoir on the Colorado River in the southwestern United States. Straddling the border of the states Utah (to the north) and Arizona (to the south), it is the second largest artificial lake in the country. The area to the north of Lake Powell is known as the Grand Staircase-Escalante National Monument, and covers over 760 000 hectares. Appearing green in this false-colour image, the Kaiparowits Plateau makes up a significant portion of the Monument, with the Fiftymile mountain (dark green) separating it from the Escalante Canyons.